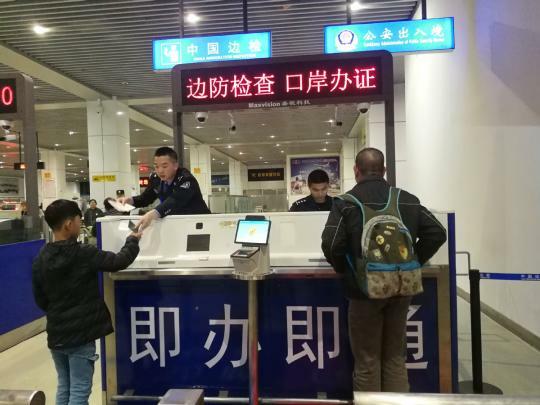 The local public security department and border control patrol jointly opened up a special channel on Wednesday for Taiwan residents to get travel permits at Pingtan's Aoqian Port. Since 2011, when a direct sea route between Pingtan and Taiwan was opened, two ships - CSF and Natchan Rera Cruise - regularly make ferry runs from Pingtan to Taipei and Taichung, Taiwan. Taiwan residents who take the ships and enter the mainland through the port need travel permits issued by mainland public security officials, and they can apply for the permits at the port. "Before, they had to line up twice - first for the certificate application and then for identification checks. When there are many passengers, the waiting time is longer," said Yuan Tao, a border inspector. "As more residents from Taiwan come to the mainland through this port, the service will be needed more." To reduce wait times, the two departments launched a special channel for Taiwan residents, combining the procedures of application, fee payment, permit issuance and inspection at a single window. "They only need to wait in line once, which saves about 20 minutes for those applying for permits at the port," he said. On Thursday night, a ship with more than 200 passengers left Taichung for Pingtan, including 30 passengers from Taiwan who were visiting the mainland for the first time. All of them planned to apply for travel permits at the port. Among them was Yeh Chen-li from Yunlin county, who planned to stay for four days. "I finished the application form on board and handed it in at the border control window when I arrived at the terminal," Yeh said. "It took about 10 minutes to get my permit, much faster than I expected." Yuan Hsiung-wei, a tour guide who took a group to the mainland from Taipei, said, "There is a bigger chance for more tours as more exchanges take place. The trip takes only about three hours by ship, so many people will want to have a look of the mainland." Wei Li is a frequent visitor. She said she will open a shop in Pingtan to sell products from Taiwan. "The transportation for people and goods is convenient from Taiwan to Pingtan, and there have been more mainland tourists visiting Pingtan in recent years," she said. Since the beginning of April, direct service by ship between the two sides have increased from seven to nine round trips a week to meet increasing demand, according to border officials. More than 35,000 people, including more than 20,000 Taiwan residents, entered the mainland at the port from January to April, up 77 percent year-on-year.